News this morning from Oilex relaying essentially that they still remain locked in alternate settlement talks with GSPC over the long running Cambay field dispute was not what bulls of the stock were looking for (including us) but, we believe that there is light at the end of the tunnel and intend to take advantage of any weakness today. These 2 para’s stuck out in particular to us – “In the event that an agreement on the current proposal cannot be achieved in the very near future, including the unpaid cash calls, the Company intends to fully enforce its rights under the Cambay Joint Operating Agreement (JOA). The Directorate General of Hydrocarbons (DGH) and Ministry of Petroleum and Natural Gas (MoPNG) are actively monitoring the progress of the Event of Default (EoD) dispute and are supportive of the present negotiations. Furthermore, GSPC is reportedly under pressure to meet obligations in several of its joint ventures. “ (highlights ours). The message here is clear – the “powers that be” in India want this resolved and resolved amicable and expeditiously. This is also a telling para – “More recently, it is Oilex’s understanding that the State Government of Gujarat and the GSPC board of directors’ have approved a sales process for a number of its local Indian joint venture participating interests. At present, Cambay is not formally part of this sale process, however, GSPC have indicated their willingness to divest their interest. Pursuant to the Cambay and Bhandut JOAs, Oilex holds pre-emptive rights to acquire GSPC’s interests in both assets.” (highlights ours). We are not privy to the terms proposed in an alternate settlement but taking the two pull outs above we suspect that Oilex are prepared to waive historic cash calls that remain unpaid in exchange for a large part (if not all) of the 55% stake in Cambay owned by GSPC. 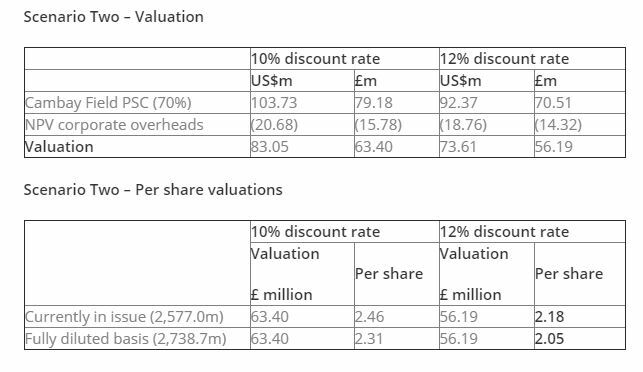 Per our piece HERE, at a 12% discount rate should Oilex wind up with 100% of the asset putting them in complete control of a new farm in partner (of which there are likely many suitors) then we estimate the value per share to be in excess of 2p (see below). As the company has de facto first refusal per the pre emptive rights we see Oilex pressing for a deal along these terms. We also posit that, should there be incremental cash paid to GSPC as part of a settlement for the full 55% of the field being returned to Oilex, a raising at a significant premium to the current stock price or coincident farm in would be the likely route taken. It seems inconceivable to us that GSPC with all their woes would want to resubmit to the lengthy and costly arbitration process but then again this is GSPC and they have drawn this out thus far. Either way, at the current stock price we believe the shares continue to trade as an option on the resolution to this dispute and not a true reflection of field value. As ever, in putting our money where our mouth, is we intend to be buyers on weakness. Oilex is a research client of Align Research. Align Research own shares in Oilex and is bound to Align Research’s company dealing policy ensuring open and adequate disclosure. Full details can be found on our website here (“Legals”).